← How to use docPrint PDF Driver printer to convert PPT to BMP image format? Do you want to know how to edit pdf page margin ? Have you ever met the question that how to edit pdf page? Here I will recommend the Advanced PDF Tools for you, because it can fix this problem.Of course, the operation is very quick and simple. So why we need the Advanced PDF Tools in this modern society? With the broadly application of the pdf files,many office workers need master the pdf silk,like Word,Excel,PPT.Because they often keep in touch with the pdf files in their daily work.Therefore,they often meet many kinds of problems of pdf files. And there is no doubt that they need this software badly. Maybe you search for the method on the internet and finally fix it.But I think it wastes your time to do that.Here is a very useful software the Advanced PDF Tools,which can solve many problems of pdf files.But today I will emphasis on how to edit pdf page margin by using this software.Do not worry about it ,the operation is quick and simple. In order to help more people who have the same problem ,right now I will put an article to show you how to edit pdf margin by using the Advanced PDF Tools. Please remember to extract it after the download is completed, for it is zipped package. Then you need to unzip it and store it in somewhere in your computer. Step 2, double click the icon of the Advanced PDF Tools, then let this software run .When this software is opening, you need to drag your PDF file into this program.Later you will enter into the application interface.You can see the label pages like(Summary/Open actions/pages/Optimize/Image/Metadata/Custom fields/About),please click the label page”Pages”,and find the title “Increase pages margin”. You need input the number that you want in stead of the default“0”.Fox example, we input the number“300,100,200”.Then save the change. Please look at picture 1. Step 3,please open the changed pdf file, you will find the change,we had already changed the pdf pages marginby using the Advanced PDF Tools.As the space is limited ,here I will not show the picture. My suggestion is that after reading my article ,you should better to operate it by yourself and you can easily find the effect of the Advanced PDF Tools ,if you are interested in the Advanced PDF Tools,or you want to know more about how to edit pdf pages margin ,you can refer to this website or visit http://www.verypdf.com/wordpress/ . How to edit pdf content size and page margins? How to edit pdf page size and content size ? How to edit pdf creation date by using the Advanced PDF Tools? How to edit pdf keywords information by using the Advanced PDF Tools? 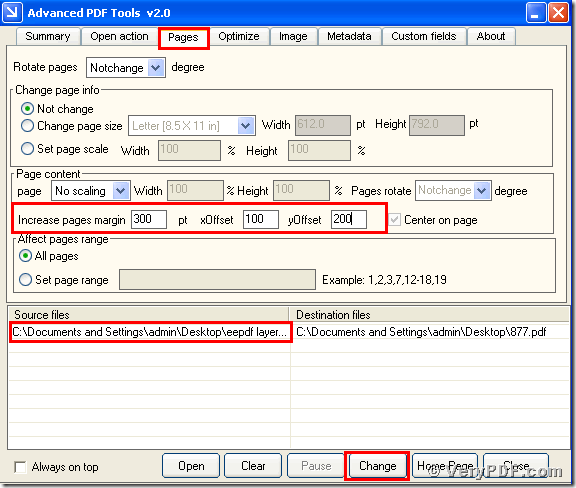 How to edit PDF author information by using Advanced PDF Tools? This entry was posted in Advanced PDF Tools and tagged Advanced PDF Tools, edit pdf. Bookmark the permalink.